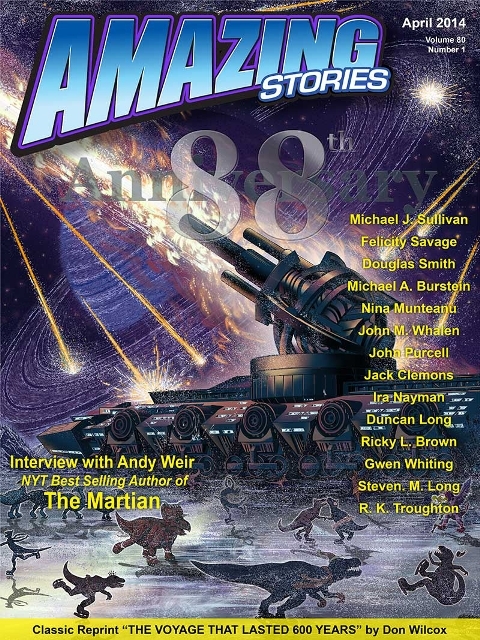 By Carl Slaughter: Amazing Stories isn’t just one of those old-time sci-fi magazines from the Golden Age of rockets, rayguns, and robots. Revived by publisher and fan Steve Davidson, it is well on its way to becoming a full-fledged speculative ezine, including pro rate fiction by current authors. 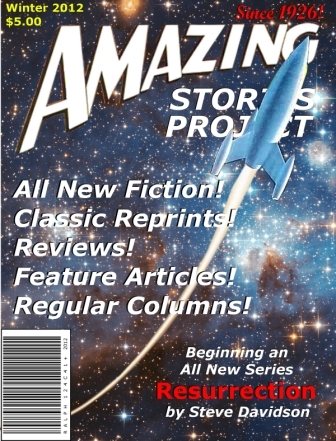 Amazing Stories recently passed 35,000 registered users. CARL SLAUGHTER: What was the inspiration for reviving Amazing Stories? STEVE DAVIDSON: I’m a history buff and an SF fan. “Firsts” have always fascinated me and beyond being the first SF mag, Amazing Stories was the first magazine I was exposed to. I’d like to believe that I “almost” got a couple of stories published in it – I did get a couple of letters and an editorial mention during the Ted White era. And, of course, so many of the founders of the genre got their initial inspiration from the magazine (and Wonder Stories) that I felt it a shame that the magazine was no longer around. SD: Initially what I stated previously; make sure the name remains in friendly, fannish hands. But then it took over three years for the trademark to register, which gave me plenty of time to analyze publishing, SF publishing, electronic publishing, social networking, etc. and I formulated a plan that can be summed up as a “social magazine”. The basic idea was to partner a daily blog with a fiction magazine, all running on a social network type platform. I wanted it to become a great watering hole for fandom, regardless of where your fandom took you. I identified 15 areas of interest (three genres of literature, television, art, film, comics, modeling, etc) that would receive regular coverage in the blog, hopefully drawing in readers whose primary interest was one or more of those disciplines. Then we’d use the social networking features to demonstrate to everyone that we all have far more in common than not. Fiction-wise, the idea was to publish new fiction and reprint fiction weekly, bundle it together for an “issue” (e and POD); bundle three months together as a “quarterly” and then do the same with the entire year’s worth as an “annual”; this was designed to make everything available at different price points. If an “issue” was perceived as too expensive, you could wait and get three of them for what amounted to a discounted price, same, with a comparatively greater discount for the annual. That of course was also designed to provide regular marketing pushes for the fiction as well – each piece would be promoted three times a year. All of the above was predicated on two beliefs. First, that the name was iconic enough that I would be able to derive income from licensing the property. This has come to pass with three licensing deals (reprint line of books, signage and the NBC TV deal) with the possibility of more in the future. Second, that I would be able to find investors capable of understanding the vision and willing to invest in a “new” kind of publishing, where the platform generated the audience. This latter concept has not borne fruit (yet). And, I was not planning on launching when I did. In fact, I wasn’t going to launch until I found the investors, but I quickly found myself under so much pressure to “do something” that I took the initial plan and trimmed it for a no-funding, bootstrap effort, which is pretty much where we’ve been treading water for the past couple of years. It’s sustainable in that I can keep the site going indefinitely for little or no outlay, we have gotten a few issues out (working on one now) and have become a regular place on the internet for fans. CS: Who’s involved and in what capacity? CS: What kind of features do you currently offer and what’s in the works? SD: Well, things have been greatly curtailed by my wife’s cancer diagnosis (this past April). Its quite serious and I am playing full-time care giver. This was a double-whammy though, as Karen was bringing in the bulk of our income while I worked on developing the site. This past August we were scheduled to unveil our plan for returning the magazine to print with two annual issues, distributed in a manner that would have been unique to the industry, eminently economical and (no exaggeration) having the potential of printing several hundred thousand copies an issue. The potential for advertising revenue was solid, our research indicated that we could START with distribution numbers of between 30 and 40 thousand copies per issue and everything would be neatly tied together for that “watering hole” I mentioned. The day before Karen’s diagnosis, I had passed pre-press info on to the staff. A couple of weeks later, Karen had a series of strokes in addition to the breast cancer and that killed all of my plans; the debut was to have been at MidAmeriCon II, where I was assured of an accepting audience (and the presence of most of the decision-makers in the field) and up until having to cancel those plans I was very confident of success. Since then the daily work has passed to Ira. We have plans – lots of them – but I don’t currently have the capacity to commit to anything long range; time is an issue, money is an issue, but we’ll keep moving forward until things change. Our licensing partners continue to move forward – Bryan Fuller has returned to showrunning for the TV show and Futures Past Editions just added the 1929 Best of anthology and a facsimile edition of the Amazing Stories Annual to our offerings. CS: What about anthologies and art collections? SD: Anthologies, drawing on the magazine’s early years are already available, with more coming. Visit here to find them all. For art, we’ve got our Frank R. Paul posters, as well as posters from two of our new issues. I’d love to do a “history of the art in Amazing Stories, but that kind of project is outside the budget at the moment. CS: Who is using the Amazing Stories name and what’s the strategy for stopping them? SD: Anyone and his brother who thinks that Trademarks work in the same way as copyrights. Hint: they don’t. I don’t want to become an industry that threatens to sue everyone improperly using the name, but I also have a duty to my licensing partners to preserve and protect it. Right now I am spending what little free cash I have on IP attorneys. The research they are doing will determine who we go after and how; we’re still trying to decide whether to get settlements from “little guys” first, or go after a big kahuna first. The latter is potentially more attractive for a variety of reasons – publicity, the potential winnings (some have already been informed of their infringement and have chosen to ignore that notice, which means they could be up for treble damages) and the possibility of making things better for many others who find themselves in similar circumstances; going after little guys first is usually done to help build a case against the larger guys, but it usually involves a lot of what some might call “intimidation” and I’m not that comfortable with that. But in the end the attorneys are going to tell me what our best course will be and we’ll pursue it. CS: Your take on the Hugo situation? SD: I think it is a shame when folks determine that the only way they can experience success is to attack someone/something else. And I think it doubly shameful when most of the initiating angst comes from ignorance (apparently willful in some cases). I view Fandom as a sub-culture. Further, it’s a mobile sub-culture, very similar (when you examine is closely) to Judaism in Diaspora. That latter culture has survived for thousands of years because it is protean and adaptable. Likewise for Fandom. We’ll get past the BS, we’ll have learned a few things, we’ll incorporate those lessons and we’ll move on. Because Trufans love Fandom for the potentials it promises and, as the Hugo voting in 2013 demonstrated, there’s one thing that will unite almost all of Fandom, and that is attacking the very idea of what Fandom is. CS: Where can we catch up with you on the convention/fan circuit? SD: At home. Due to my duties as caregiver, I have had to forgo all travel. This entry was posted in Sercon and tagged Amazing Stories, Carl Slaughter, Steve Davidson by Mike Glyer. Bookmark the permalink. Steve Davidson has an editorial about the Puppy situation on Amazing Stories at the link below. I have been coming across the older Amazing magazines in good condition at my local used and rare bookstore I rarely go to. I might have one or two of them on my bookshelf from the 60’s. Sorry to hear about your wife. Hope she fully recovers.